Quantum networks will support long-distance quantum key distribution (QKD) and distributed quantum computation, and are an active area of both experimental and theoretical research. Here, we present an analysis of topologically complex networks of quantum repeaters composed of heterogeneous links. 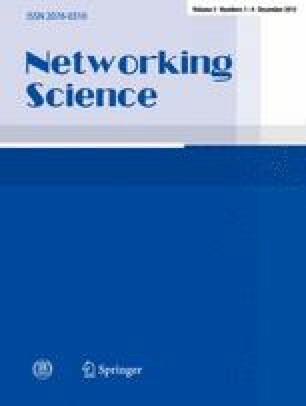 Quantum networks have fundamental behavioral differences from classical networks; the delicacy of quantum states makes a practical path selection algorithm imperative, but classical notions of resource utilization are not directly applicable, rendering known path selection mechanisms inadequate. To adapt Dijkstra’s algorithm for quantum repeater networks that generate entangled Bell pairs, we quantify the key differences and define a link cost metric, seconds per Bell pair of a particular fidelity, where a single Bell pair is the resource consumed to perform one quantum teleportation. Simulations that include both the physical interactions and the extensive classical messaging confirm that Dijkstra’s algorithm works well in a quantum context. Simulating about three hundred heterogeneous paths, comparing our path cost and the total work along the path gives a coefficient of determination of 0.88 or better.